Many of you will know that I have not only struggled with my skin over the last few months but I also am very fussy about what products I will even try, let alone keep using. A few weeks ago L'Occitane approached me about collaborating* with them to showcase their new Aqua Réotier Collection. While I was excited about working with a brand I love and am familiar with, I wanted to make sure the products actually worked for me before sharing them with you. I suffer from perioral dermatitis which manifests in red, tight, dry and bumpy skin around my chin and nose-believe me, not pleasant. It took me months to clear and I believe stemmed from over stimulating my skin by frequently introducing new skincare products that were too harsh for my poor face. So, as result, I am very cautious in what I will trust not to flare my skin up. As soon as I started to read up on the collection I felt relieved as it is all based on water, specifically, the water of the Réotier spring in Provence which is enriched with minerals and has an especially high concentration of calcium, 10x richer in fact than other French thermal springs. You may not realize it but your skin is made up of water, approximately 64% to be exact. Ever noticed your face almost looks like crepe paper when you're dehydrated, that's when I know I need water, both on the inside and out! The high concentration of calcium in the Réotier spring is essential for helping the skin maintain it's barrier and stay hydrated. When this spring water is combined with powerhouses like hyaluronic acid and glycerin you know you are on to a winner. Hyaluronic acid is a powerful humectant that helps bind moisture to the skin to help keep it looking plump. Glycerin is also a humectant, attracting moisture onto your skin while also acting as an emollient, making your skin not only moist but soft and supple to the touch. I always look for glycerin as an ingredient in moisturizers and makeup primers, it does a great job of binding makeup to your face while also preventing it drying out and cracking or flaking off. There are 5 products in the Aqua Réotier Collection which I will talk you through now. I always start my day by cleansing my face, even if I'm not showering and I'm straight off to the gym I can't leave the house without washing away the impurities that my face may have picked up overnight. The Water Gel Cleanser, €19 is a lovely light gel that transforms into a light lather when mixed with water. I cleanse thoroughly before following in with my new favorite product, Aqua Réotier Moisture Prep Essence, €24, in my opinion, a hybrid between a serum and a toner. I swipe a cotton pad soaked with the essence over my face and neck and leave it to settle for a few minutes before going in with my moisturizer. I find my skin looks plump and hydrated immediately after use and isn't left dry and tight the way a toner can sometimes leave me. After using the essence and usually right before I sit down to apply my makeup I go in with the Aqua Réotier Thirst Quenching Gel, €29. I have spoken many times about my personal preference when it comes to using a gel moisturizer over a cream. I find them less heavy than a rich cream so they're less likely to clog my pores, using a gel-based product makes me feel like my skin can breathe. This one is especially hydrating as it contains thousands of micro-bubbles that instantly recharge skin with water. Its formula is super silky and glides onto skin acting like a magnet to hold-in moisture all day long. I find my foundation glides on top of this product and doesn't dry out throughout the day or "crack" and separate around my mouth and chin. The final step I like to take after applying my makeup is to mist my face with the Aqua Réotier Fresh Moisturising Mist, €14. Especially after using powders, my skin can lose its radiance and look dull, a veil of this mist and my skin is instantly back looking dewy and hydrated, all hints of a powdery look gone. I also like to take it in my gym bag and out with me during the day to refresh my face if and when I need to. While I haven't personally been using it as I can't stop reaching for the gel version, the line also includes a moisturizing Thirst Quenching Cream, €29, if that is more to your preference. Its light texture combines the refreshing thirst-quenching benefits of the gel with the softening and smoothing properties of a cream. I imagine dry or aging skin may prefer the comfort of the cream but for me the gel ticks all the boxes. I find the collection really well priced ranging from €14 to €29 for each product, however, L'Occitane currently has offers on in which you can bundle and save even more. I have listed them for you below but in my opinion the best option is to grab the 4 products, cleanser, essence, moisturizer of your choice and facial mist for a steal at €65 opposed to €86. 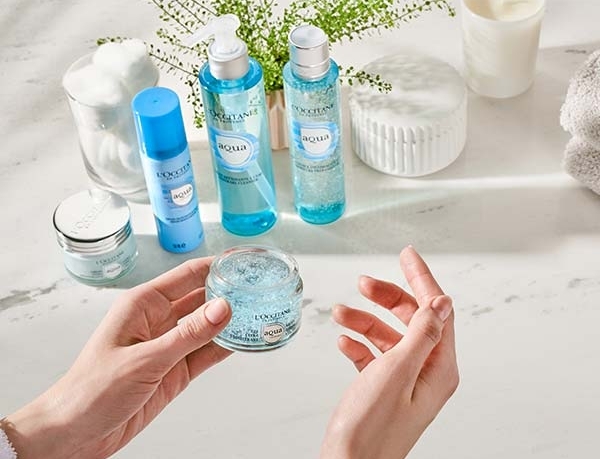 You can discover more about L'Occitane's new Aqua Réotier Collection in store and online here today, hope you love it as much as I do! *This post is a paid collaboration with L'Occitane, all views and opinions remain my own. Thank you to L'Occitane for collaborating with me!